On the morning of March 6, 1954, a young medical student in London completed his rounds at St. Mary’s Hospital. He then embarked on a 57 mile journey. The first 56 miles were taken by train from London to Oxford. The last mile was taken by foot on a cinder track off Iffley Road in Oxford. It was this final mile that would make history. The trip back to Oxford that day was a homecoming, of sorts, for the young medical student. He had obtained his undergraduate degree from Oxford University, and during his student days there he had been a member of the University’s track team. At the beginning of his studies at Oxford, he wasn’t a particularly fast runner. He ran his first mile in the comparatively unimpressive time of 4:53. But over the next few years, his mile time had dropped dramatically, and by the time he made that journey on that spring morning from London to Oxford he was one of the three fastest distance runners in the world. He and the other two, John Landy of Australia and Wes Santee of Kansas—were in a global race to see which one of them would be the first man to ever run a mile in less than four minutes. There was no ESPN in those days to telecast the efforts of these three young runners to break the four minute mile barrier. But in a very real sense, the world was watching, awaiting the news on radio or telegraph that one of them had done something that some so-called medical experts said could not be done. 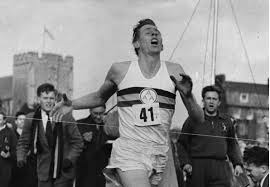 Some 1,200 people gathered at the Iffley Road Track in Oxford on that overcast and somewhat blustery spring afternoon, and they indeed saw history made as the medical student—young Roger Bannister—ran the fastest mile in history, crossing the finish line in 3:59.4. Dr. Roger Bannister ran only two more races after his historic run. And at the end of 1954, he retired from running, explaining that he needed to devote his life to becoming a doctor. He would go on to be a distinguished neurologist both in research and clinical practice. Roger Bannister died on Sunday at the age of 88. But his incredible sub-four minute mile will live forever in the hearts of runners everywhere. Peggy McClure: Great article. Sent Ken and Donald the obit. What a legend! !